This round of the Moseley Park Sock Club will run for three months over January/February/March 2018. Total cost for this club will be AU$99.75. Because the store automatically adds the postage to items, the third lot of postage will be added as you go through Checkout to make a total of $99.75. 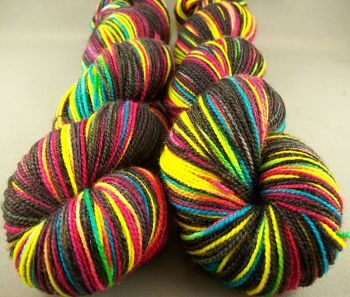 Each month you will receive a fabulous 100gm skein of sockyarn handdyed especially for the Sock Club, these colourways will not be available on my store and are exclusive to the Sock Club members. The yarn bases will be different each month, and may include knitted blanks, self striping yarn or singles yarn. A different dyeing technique will be used each month. Signups close for this club on Saturday the 26th January. The Sock Club parcels will be posted out on the 30th of each month in a prepaid satchel. If you decide to order a a double lot of the Sock Club the extra postage wll be refunded, and they will be sent together in the same satchel.